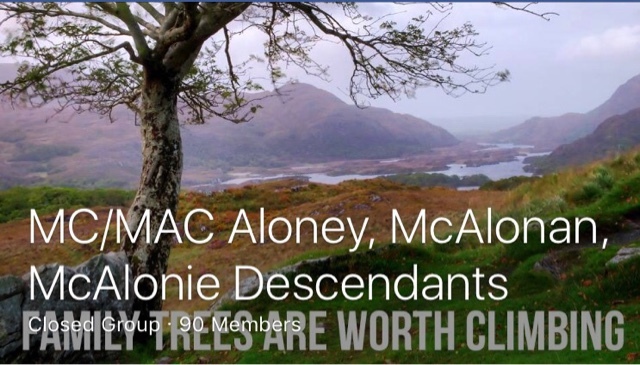 Above is the Mc/Mac Aloney, McAlonan, McAlonie Descendants Facebook Page. I have utilized my travels over the last 4 years to meet many cousins across the United States. Last November and in January I traveled to Canada to meet cousins as well. Growing up all I knew about my name was from my grandfather who made sure that we knew were Scottish. In the 1980's when I had gone to Edinburgh, Scotland to research MacAloney, there was no records of the name. I knew from my family that my great grandfather was born in Nova Scotia along with his children and then immigrated to northern Massachusetts with his family in the very early 1900's. It wasn't until I learned about my cousin Sandra, in Nova Scotia, who was documenting the Mc/Mac Aloney families in Nova Scotia, who my ancestors were back to Northern Ireland. That right, Northern Ireland not Scotland. Sandra also had found that the Mc/Mac Aloney's were McAlonan's in Northern Ireland and changed their name back to McAloney upon arrival to Nova Scotia. We have theories but no conclusive reason for this. There are 11 independent Mc/Mac Aloney families that came to Nova Scotia, but there are no records to positively tie them together through revords but we all believe we are all one ancestry of the family. To make this more confusing is that in the late 1800's all the families spelled their name Mc Aloney, not MacAloney. In the late 1800's religion caused a split in families with Catholic families using Mc and Protestant using Mac. Some families had splits in their families with some using Mc and others using Mac. My family used Mac, but regardless of spelling we are all one family heritage. Enter Graeme Macaloney who's family didn't go to Nova Scotia from Northern Ireland to Scotland. Yes, Graeme's family spells the name with the second a uncapitalized. I was always told growing up that Mac and Aloney are separate words and this is how my family writes it. Where Mac = son of and then Aloney. A two word last name causes problems within our digital world so I use MacAloney often to prevent confusion when digitized forms are used. Graeme has been researching the MacAloney's in Scotland and our connection to the Cameron Clan. He initiated the Family Tree Y-111 DNA testing that matched us as of the same ancestry although it is about 200 years ago most likely in Northrrn Ireland. We have now a female McAloney who is carrying her father's Y DNA that also matches with Graeme and me. We are each seperated by only two DNA markers each, which is out of 111 markers. 2 markers being different is expected, with one marker separation for each 100 years. This means we have 3 different lines of MacAloney's with no exact ancestor tie are now tied by DNA. We are hoping that all MacAloney and various spellings to be tested to prove our theory. In the meantime Graeme is continuing his study of MacAloney's in Scotland and what he has found is that our name was spelled differently over time due to the Scottish brogue that wasn't a written language and anglification of what was heard. It also has to do with how Scottish names were formed. Here is Graeme's comments on this. I started out with "What's in a name?" From what we know is that at one point in history there were no MacAloney's as they had changed their names to McAlonan. Something also caused these same MacAloney's to remember their roots and bring the name back. We hope through DNA testing we can pull more pieces of the MacAloney's together and our tie to the Cameron Clan. What is your family's name story?